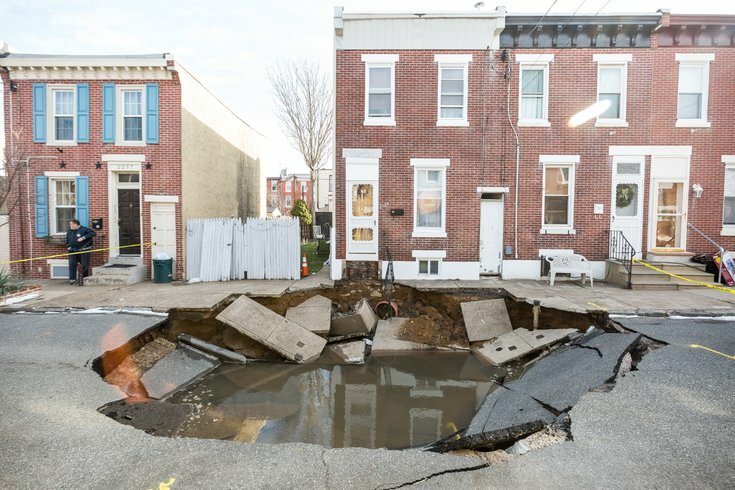 Massive sinkhole opens up on Taggert Street in Fishtown on January 19, 2018. Sinkholes have a weird way of upsetting a viewer's sense of order in the world. You see a gigantic hole in the street and it makes you think you've survived some kind of earthquake. The reality is that infrastructure can fail for any number of reasons. 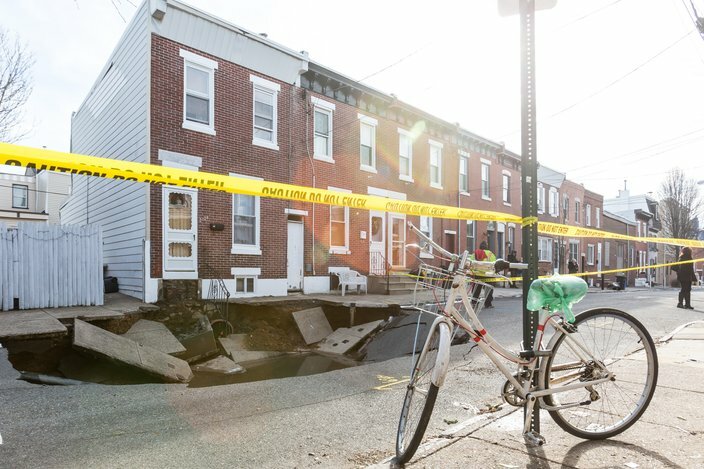 Around noon on Friday, neighbors on Fishtown's tiny Taggert Street — a single block connecting E. Norris and E. Dauphin Streets — were stunned to see a giant sinkhole form outside one of the rowhomes. "Tons of rats were flying out of the hole," one witness told PhillyVoice. Another neighbor and longtime Fishtown resident said the incident may have been related to a plumbing issue. Diane Taylor, a neighbor on parallel Ritter Street, has a garage on Taggert Street right in front of the sinkhole. She isn't happy about how the city handles these and similar issues. 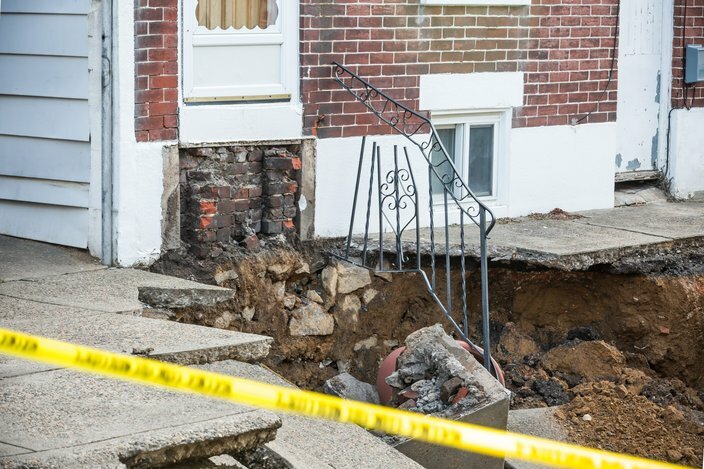 The front steps of a house on Taggert Street in Fishtown collapsed into a massive sinkhole on January 19, 2018. “They only patch things, they don’t fix it the right way," Taylor said. "All the time I smell gas. I don’t know if that has anything to do with this, but a lot of the neighbors also smell gas all the time and it’s never fixed. They put band-aids on everything." 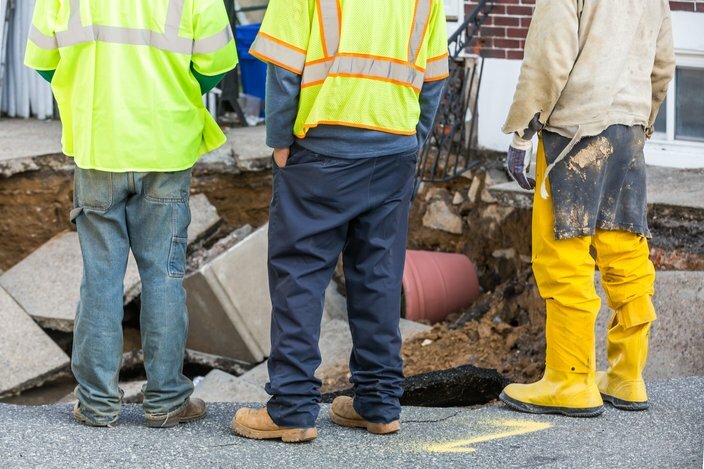 Philadelphia Gas Works and the Philadelphia Police Department were both at the scene Friday afternoon as maintenance crews worked to resolve the situation.. Six homes were evacuated and officials said the sinkhole measured approximately 30 x 30 feet. Workers inspect a massive sinkhole on Taggert Street in Fishtown on January 19, 2018. The incident comes as the Philadelphia Water Department struggles to keep up with the damaging effects of a wintry blast that lingered from late last year into the first half of January. The department still had 170 outstanding leak investigations as of earlier this week. Customers calling in complaints have faced an average wait time of two hours, leading PWD to invite service requests via their social media channels for the first time. Attempts to reach the Philadelphia Streets Department were not immediately returned Friday afternoon. PhillyVoice photographer Thom Carroll contributed to this report.